> A Chevrolet Spark RS? 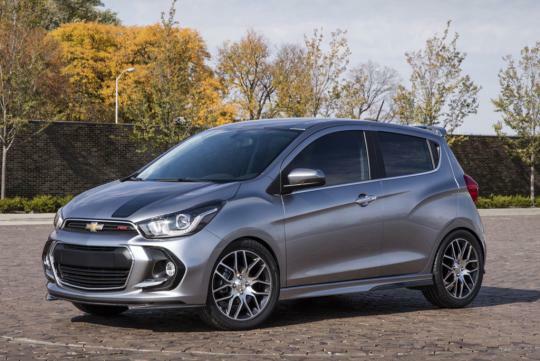 Chevrolet will bring an RS concept of the new Spark to SEMA, signaling that its styling package will be applied to the brand's smallest vehicle in the near future. We can expect the usual stuff in a production Spark RS – larger wheels, a slightly sportier cabin, a more aggressive body kit, and a small drop in ride height – but for the concept, Chevy wasn't restrained by things like budget. The front splitter, and sill extensions, foglight surrounds, and rear bumper insert are all finished in carbon fiber. The 17-inch alloys are apparently inspired by the Corvette Z06's Z07 package, while the Dark Liquid Switchblade Silver paint is broken up only by a driver's-side stripe. The company will also showcase its new Red Line accessories, features both concept and production parts for the Trax, Camaro, Malibu, Colorado, and Sierra. Every vehicle gets Enhanced Silver Metallic paint, a charcoal finish on the roof, satin graphite/red graphics, black/red badge kits, and aside from the Colorado, tinted lamps. Individual mods for the Trax include relatively simple tweaks, including new 18-inch wheels, blacked-out bowtie badges, a lowered ride height, and custom badging. It's a similar story on the Malibu, except that its 19-inch wheels are a smidge larger, and its lowered ride height is the result of a concept kit. The first concept based on the new Camaro opts for 20-inch wheels, while adding a few more performance items. The ride height has been lowered, there's a new air intake system, and an upgraded brake package. Chevy has also replaced the front upper and lower grilles inserts with red accents. We sure hope this model makes it on the roads and to our shores someday! Get a local firm as a service provider to add on OR have a order website to kit the car - DIY style..
Then voila a RS ..